It only takes one word to describe these pretzels... awesome! This is also a super easy recipe for those of you who are afraid of yeast... there is no rising, punching, etc. 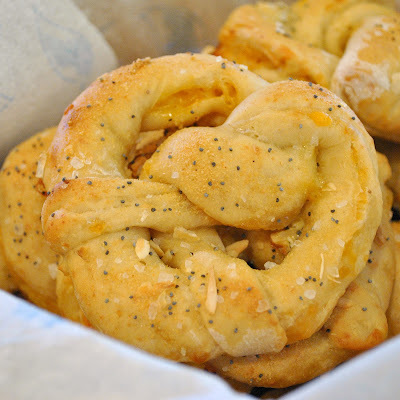 This recipe also skips the normal soft pretzel step of boiling the dough in a baking soda bath before cooking as well. 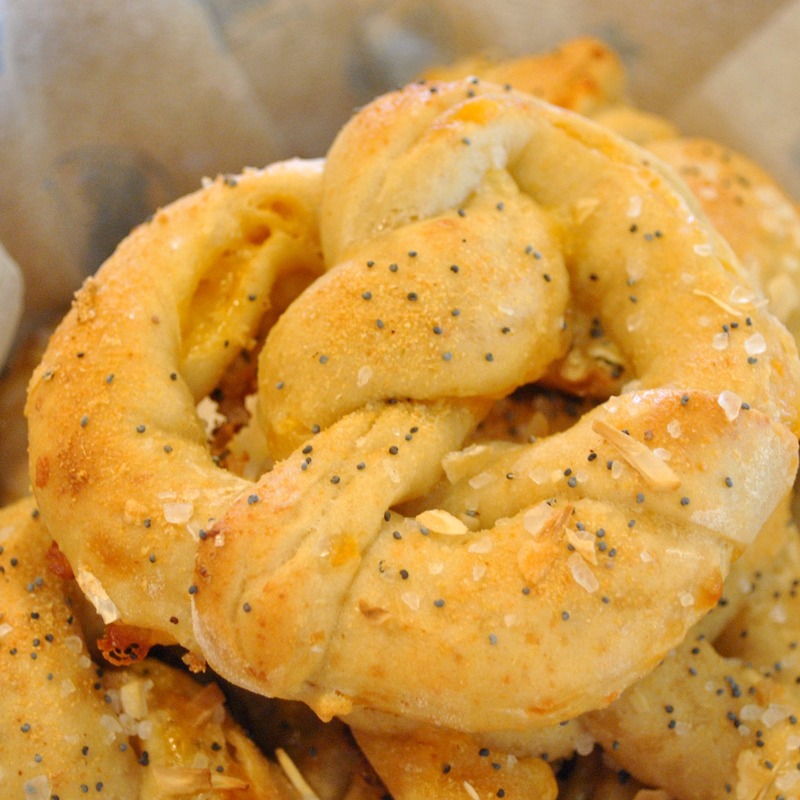 This makes for an incredibly quick pretzel recipe. I think I had these mixed, rolled, shaped, and baked in under an hour. In a large measuring cup, heat water and sprinkle yeast over the water. Stir to combine and let sit for about 10 minutes until frothy. Meanwhile, in a food processor fitted with a dough blade, combine all dry ingredients and pulse to combine. Add egg and yeast mixture and pulse in short bursts until the dough comes together. Do not over mix, you just want the dough to come together. Turn out onto a lightly floured surface and knead a few times with your hands. If dough feels sticky, add a little more flour. Form the dough into a ball and cut in half. Roll out 1/2 of the dough into a large rectangle, approximately 12"x17", sprinkle about 3/4 cup of the colby jack cheese down the center 1/3 of the dough. Fold one edge over the cheese, sprinkle with another 3/4 cup cheese, and fold over the remaining 1/3. Pinch the edges of the dough to seal the cheese inside. Roll out the dough again into a rectangle about 11"x15". Cut the dough into six strips approximately 1 1/2" wide. Roll each strip into a tube and form into a pretzel shape by looping and crossing the ends over each other, then tuck back onto the loop and pinch to seal. Transfer to a baking sheet covered with parchment paper. Repeat with remaining half of dough. Preheat oven to 425 degrees. In a small bowl, combine remaining egg and milk. Whisk to combine and set aside. In another small bowl, combine poppy seeds, garlic, onion, and salt. Brush the pretzels liberally with the egg wash, then sprinkle with spice mixture. Bake 18-20 minutes until light golden brown. Transfer pretzels to a wire rack to cool. These look delish! Can't wait to try them, thanks. If these turn our half as well as your lovely English Muffin Bread does for me I will be one happy little baker! They look delicious. May I ask how you store these? I know the salted pretzels I make cannot really be stored more than two days so I was curious about these? These won't last much longer than that either... the best way to do it if you really want to keep them is to freeze them. Is it okay to not mix it in a stand mixer? Well I did them in a food processor but you could do them by hand pretty easily too. no baking soda water wash? Not with this recipe... although it's a typical step in pretzel making, this recipe is a shortcut recipe and doesn't do it. You could use a typical pretzel recipe, do the baking soda wash and just add the everything seasoning on the tops if you preferred. I'm not sure if the cheese stuffing would work if you did the baking soda wash, I have a feeling it would be quite messy. How many pretzels does this make approximately? I can't seem to find a yield on this page... :) I need to make for 10!